England boss Mark Sampson says players still have time to force their way into his World Cup plans after victory in the final home friendly over China. Sampson, 32, is expected to name his 23-player squad on 11 May for the tournament in Canada in June. But he says "30 to 35 players" are vying for a place and domestic form will be taken into account. "There is still a great opportunity for the players to force my hand," the Welshman said. "We have a number of domestic games coming up and the players know if they go back and maintain good form, then we will be in a position to pick the best squad come 11 May." England begin their World Cup on 9 June against tournament favourites France, before facing Mexico and Colombia in Group F.
Seventeen players got a chance to show their value to Sampson in the 2-1 win over China on Thursday at Manchester City's Academy Stadium. Forwards Jodie Taylor and Fran Kirby both scored in the first 10 minutes before England conceded a sloppy goal from a corner and lost their rhythm. But Sampson highlighted the case of Chelsea winger Gemma Davison, who was a late call-up to the squad after scoring three goals in her club's opening two games this season. 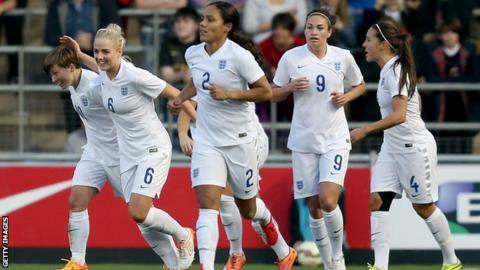 Davison last played for England in the 2014 Cyprus Cup. Sampson, who will take England into his first major tournament since being appointed in December 2013, added: "The door is open. You have seen the likes of Gemma Davison. "She will feel she can go back and make a statement, then you have to make a decision in relation to form, how they play for club and country, and the right blend of characters that we want to represent us in the summer."